Eminent Domain is absolutely one of my favorite deckbuilding games, and I've played a TON of them. Just look at that box - it's gorgeous, and the inside looks even better. The cards are glossy, the tokens are round as an apple and smooth as a baby's bottom. Even the cardboard pieces are thick and heavy in a way that reminds you of a nice walking stick on a long hike. This one's got everything I love about deckbuilding games, and very little of the things I don't like, and for that reason it wins the "favorite game I discovered in 2013" award that I definitely didn't just make up. If you've never heard of a deckbuilding game, fear not, I'll explain. Generally, players start with identical (or close) decks of cards, and they use those cards to acquire better cards from a community pool (there are many ways to do this). As players gain new cards they go into players' decks, thus allowing players to "build" the decks they want to use throughout the game. Many deckbuilders lose their appeal when played in large groups, or if a player plays slowly - there's just so much "down time" for players that it can become difficult to maintain immersion and really enjoy the game. Eminent Domain is designed specifically to give players choices during other players turns, and that's a big part of why I enjoy the game as much as I do. The other half of its uniqueness is the way in which single cards are used for multiple purposes - both as cards for initiating actions, and as resources to be spent from the hand. Players start the game with a deck composed of 10 cards, 2 of Survey, Colonize, Produce/Trade, and Research, 1 Warfare, and 1 Politics (which works as a kind of one-time wild card). These cards are used to discover new planets, colonize or attack them, manufacture and sell goods, and discover new ways to be more efficient in each of these things. In Eminent Domain the cards and are both the resources used to complete tasks and the prompts to take actions in the game. Used only for space highways, or galactic parking lots. Each round, a player does three things - chooses to perform an Action (optional), takes a Role (mandatory), and performs Cleanup (mandatory). This is a simple structure that belies a deeper strategic balance. There are a lot of possible actions, and the ways in which actions and roles are combined and used is the almost all of what determines the victor of the game. 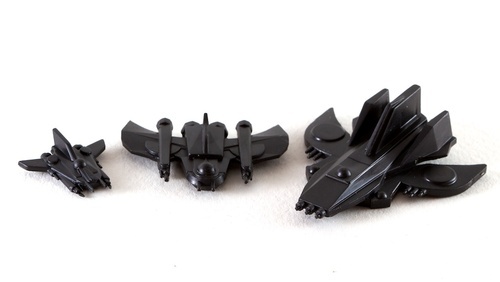 Then, the active player MUST choose one of the six Roles available, which are almost identical to the actions, except that the active player is given a small bonus for taking the role (like the ability to gain an extra fighter, or see an extra planet during a survey). Here's the best part - after the active player chooses a role, each other player can choose to "follow", and take the same role (but without the bonus), or "dissent" and draw a card. The ability to make plays on other players' turns makes turn-planning much more interesting than in most deckbuilder games, where a player usually makes a single decision on buying a single card that's available, and waits patiently (or impatiently, in my case) for the next turn. I LOVE having to plan for multiple uses from single cards and manage my hand in order to maximize the things I can do on a turn. Finally, the active player discards any unwanted cards, and draws up to a hand size of 5 (and no higher). This is unusual for deckbuilding games, as most require that you discard your entire hand at the end of each turn. 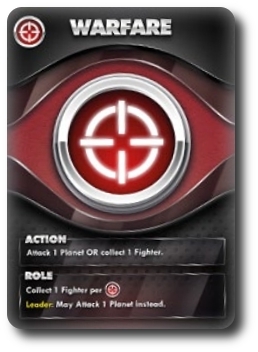 1) For its "Action" ability: the player performs the action listed on the card, then discards the card. Players may take up to one action per turn. 2) As the card you take into your hand when you select a "Role": the card is placed directly in your discard pile, and is thus added to your total pool of cards for the rest of the game. 3) As a resource as player takes a "Role": the player discards the card without playing its action, counting only the symbol on the top-left corner of the card towards the check for the "Role". Players must take one role per turn, but there's no limit to the number of cards that can be discarded to add to the role's total. Wow, so that's a lot of words about cards. There's also a way to win this game - by having a more awesome galactic civilization (represented by victory points, of course) than your opponents when the game ends. The end of the game is triggered in one of two ways; by the exhaustion of the pool of victory points, or, more likely, by the exhaustion of 1-2 of the stacks of cards from which players choose roles. I've highlighted the roles required for players to move towards the types of victory points because it's a nice display of the "order" of the game. Players start with a "starter" planet, and have to acquire new planets (through Surveying), then have to make the decision to Colonize them (with Colonize cards, which get buried under planets until they're settled) or to Attack them with ships gained through Warfare cards. The first real decisions players make are to choose between colonizing, attacking (warfare), or focusing on research in order to gain an advantage. Fortunately, the game is well-designed, and there's real balance between the different paths; so much so that I've found the only real tried-and-true strategy is to simply do what the other players aren't doing. It seems simple, but in resource-allocation games (which Eminent Domain is, at its heart) staying away from the clamor for resources can often leave a player in a great place at the end of the game. A full game with 3-4 players takes about 45-60 minutes, and turns move very, very quickly. I've found that there's enough going on to keep players engaged, but not so much so that it's impossible to have something on TV (like the Super Bowl, for instance) or carry a conversation at the same time. 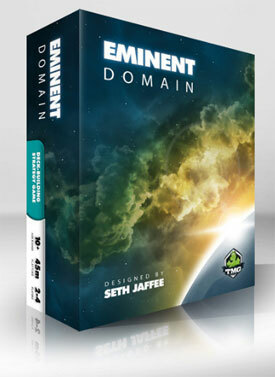 I love Eminent Domain for its uniqueness, and for its theme, and because the pieces and cards are very, very nice. I've just purchased the expansion, Eminent Domain: Escalation, and I'm looking forward to discovering the new mechanics and cards it introduces. I'll be sure to write a continued review when I've had a chance to digest the new content. For now, take the opportunity to play Eminent Domain if you see it on a demo wall at a Friendly Local Game Store, or in a buddy's collection! I'm going to go with something Mark said: It feels like the game ends just as you get a handle on your engine. I agree wholeheartedly with this, though I only have about six games of ED under my belt. It is certainly the easiest deckbuilder to teach, and my daughters enjoy it. funny, I find it really difficult to teach this game - maybe it's because I've played so many other deckbuilding games. I always struggle to explain the idea of discarding cards during the role phase. To me it is the dissent/follow decision and play that makes this a much more interesting deckbuilder. And per my previous comment, that may be where I am going wrong in strategy. I don't consider dissent/follow plays in my card usage, so I don't plan my purchases/card gains to take that into account.